My Faith Votes is an initiative of concerned American Christian citizens who have realized that Jesus followers by their silence have permitted our country to lose all that has made the United States the greatest nation in history, its Judeo-Christian roots. That silence by those living from a biblical world view has established and permitted government actions and inactions that have brought our country to a place where we, and especially our children and grandchildren, face dire and potentially devastating consequences unless something very significant is done now to reverse the situation. We believe that if there is not a true change accomplished by the votes of American Christian citizens in the general national elections of 2016, all could very likely be lost, and the next generation will have to pay the price. 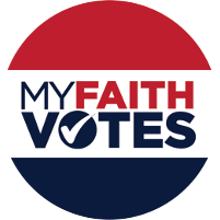 To learn more about My Faith Votes, please visit their site at MyFaithVotes.org.